Really the best event I have ever attended in terms of knowledge gathering on software solutions and networking with other participants. One hundred times better than any tradeshow. With record attendance at the last event, more companies are finding that attending the ERP Vendor Shootout™ is the way to go when evaluating Enterprise Software. Offering the opportunity to see live, scripted product demonstrations from the top ERP vendors in the world, in one event, is just as much a time saver as it is a cost saver. Companies from all over have accomplished, during this 2 day event, what would normally take months of organizing, logistics and planning. The 10th ERP Vendor Shootout™ is scheduled for May 18-19, 2011 in Chicago, IL. Moderated by Technology Evaluation Centers (TEC) of Montreal, Canada and sponsored by IBM (IBM), the event is geared toward organizations in the manufacturing and/or distribution industries who are currently budgeting for an upgrade or replacement of their current Enterprise Software solution. Through an “apples to apples” comparison from top vendors, companies can ultimately walk away with a short list of potential ERP products. The goal of the event is to simplify ERP software selection processes, alleviating some of the painful inefficiencies by coordinating onsite software presentations and delivering them in one event. The scripted demos cover product functionality, user interfaces, and overall usability. In addition to the scripted demos, each product presenter will cover additional topics and key functionality specific to each product. 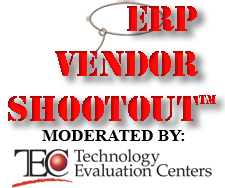 For additional information, sponsorship opportunities or to register for the 10th ERP Vendor Shootout™ at Early Bird special rates visit http://www.erpshootout.com or call 877.907.2702.